There’s no shortage of DNS Server options out there, with Google DNS, OpenDNS, your own ISP’s, and the gazillion of others available to use. The question remains though, which of these DNS servers is going to be fastest for you? And how do you know which is fastest? That’s where NameBench comes in. NameBench is a free application that will run a set of benchmarks based on your web browsing history and tcpdump, and will report back the fastest domain name server(s) for you to use. In some cases, switching to the suggested domain name server can be a considerably speed increase, with noticeably faster page loads, making this a very worthwhile tool to try. It’ll run in Mac OS X, Windows, and Linux, but of course we’re focusing on the Mac here. Don’t be surprised if Google’s 8.8.8.8 public DNS server is the fastest, it’s reliably speedy for almost everywhere in the USA. 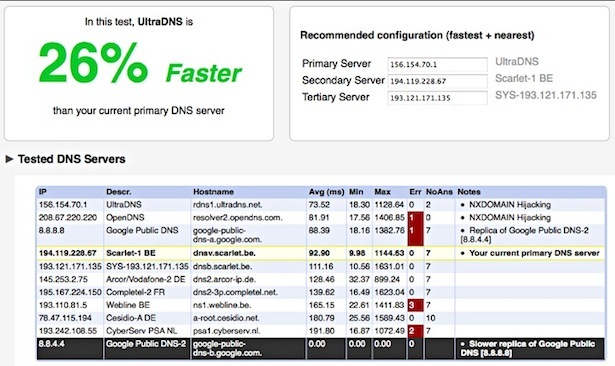 Everything is benchmarked against your current DNS settings, and you’ll get a “percent faster” report telling you how much quicker the found alternatives are. If you find a faster DNS server available, and chances are good that you will, just pop them into your Network settings to see how they go… head over to  Apple menu > System Preference > Network > Advanced > DNS > and add your new servers. That’s all there is to it, enjoy your faster internet and web browsing. Pretty great, it works! For me, this is the best tip so far this year. I use OpenDNS but I have wanted to know for a while whether that was the best option for me. I’d say that this thing is treacherous. If you value your privacy, i.e, want to keep your browsing history away from prying eyes, then don’t use ‘namebench’. I ran namebench and on the resulting readout I viewed the query details and it listed literally hundreds of the websites that I’ve been to and, of course, it’s got one’s IP address, too. “This project began as a 20% project at Google”. So, Google is still associated with this project, no? And, I’d imagine, namebench’s developer has access to the info gotten from namebench’s users. What, then, does the developer do with the info? Apparently, one’s browsing history and their website IPs are retained somewhere, most likely at the internet server that one is using. On namebench’s UI, under ‘Benchmark Data Source’ one chooses from a couple of one’s browsers or something called ‘Alexa Top Global Domains’. The benchmark data is then collected from one of these sources. Anyway, think twice, or even thrice, before using ‘namebench’. Ignorance and paranoia are not always a bad combination, but in this case, they are. The browsing history is taken from your Safari browsing history. The request is submitted directly to the DNS server being timed. If you don’t want NameBench to use your browsing history to test the servers with locations that are specifically relevant to your browsing style, select the Alexa Top Global Domains option. It won’t produce the exact same results, but could certainly still produce results that do provide a faster browsing experience. As for the privacy concern in general, you can use VPN servers, TOR protocols, or free proxy servers if you decide to do something that you don’t want easily traceable back to you, but there is absolutely no way to make any use of the Internet with the guarantee that your activity is not being tracked and/or recorded by someone along the way. Get over it. TOR is not for most people and CERTAINLY not for finance or personal login sites. free proxy servers are even worse. VPN servers should answer the questionnaire from Torrent Freak annually — intentionally not-using logging. This is absurd advice prima facie. All of which were prior Name Server queries. Kettle, please follow your advise. I found out about this a while ago and I tell you, it works wonders! Has made my surfing way faster! @too: If you don’t want namebench to use your browser history, simply use the “Benchmark Data Source” dropdown and select the Alexa 10,000 dataset. The results are not as accurate, but it’s great for the paranoid. If you look at the source code to namebench, you will see that it does not send data to anywhere other than the selected nameservers. No information is stored. As with all DNS servers, including your ISP’s, it is likely that they may be doing some short term query log storage. While I cannot speak for your ISP, who would see your DNS queries anyways, Google delete’s their query logs within 48 hours (and does not correlate your logs with any other sources: http://code.google.com/speed/public-dns/privacy.html). In any case, be on the lookout for namebench 1.2 coming out in the next week, which is twice as fast. Solved with a trustworthy VPN service like TorGuard. Pick your own from torrent freak’s VPN annual roundup. Google cannot be trusted as their business model is profiting from #PrivacyRaping. I just wish that they are respecting what they said in that faq(Google delete’s their query logs within 48 hours (and does not correlate your logs with any other sources)…but i doubt.Anyway i got the google dns and it is much faster than my isp. Google is first an advertising network. Information is money. Google profits from #PrivacyRaping you and everyone else. Respect your dignity and DEFEND your privacy RIGHT. > is much faster than my isp. It is in your ISP’s interest to not-fix Name Server slowness. You pay for X amount of service and they only provide 1/X with the addition of craptastic wifi AP. Problem DNS speed solved with NameBench, thanks for great share. Running Yosemite 10.10.5, with 20+Mbs fiber connection. Nameservers 1.31 is running very slowly, first running 40 threads reasonably quickly, then auto re-running 6 threads at about 8 queries/sec. Can’t see why this is so slow. I tried reducing queries to 25 from 250, with no real difference in speed…. I clearly need help I am now trying for a second time to run this program but it hangs every time when”running final health checks” in the current case it seems to be stuck on 10/11 any ideas would be useful. Google DNS and OpenDNS are widely in use, it doesn’t matter what kind of time machine you have. Dignity is not a commodity. Using google services is foolish. If you’re planning on running this archived, nifty little app, pack a sandwich, you’ll be here a while. As always, if you want a faster connection, give more money to your ISP and accept Jesus as your pocket savior. I got results after 2 hours, yay. Some ISPs most notably timewarner, specutrum, and commiecast have ABYSMAL network design and piss poor plant maintenance. EXPECT to suffer GHASTLY latency, jitter, and routing trauma, plus SIP abuse. No amount of money spent in their network will help. Dedicated ethernet providers with SLA will be required like I now use for VoIP in the house. The program itself is not harvesting data, unlike your Facebook account, the ad networks you allow on your browsers, your cookie leftovers… Then there are all the formal and informal technologies used by the ISP and potentially the government who skims your data, and collect it for their future reference. Time and time again, it is proved in human history that formality of needing a reason to find a person guilty turns into a despot / dictatorship in the long run. (This is really well illustrated in Daniel Suarez’s “Influx”, proven in testimony from various US Intel Congressional hearings, like Apple and the iPhone that they wanted to crack. They wanted to override Apple’s encryption by force. It was a landmark case by Apple to deny it, and the stupidity of the FBI really reared its ugly head there. But why stop there? Why not just make things up as the reason to accuse, incarcerate and or potentially kill? Who cares about facts that can never be interpreted? There are governmental and corporate operatives that NEED to use the budgets to prove something, so as to not upset their dependents at home. This ‘power abuse’ is HISTORICALLY proven and a major failure in human history time and time again. So it is worth doing things to protect yourself, but it is not going to be a major breach because you used DNS Bench. It will be moreso from your ATT / ISP connections, your Yahoo email account access (past and present), Windows Customer Experience Improvement Program, your social media stuff, your chorome store / Android phone apps that you were not closely paying attention to, as well as your bank that was too thrifty to actually keep upgrades on their web technologies and CRM patches. Again, as in other governments, there is no need to really have a real reason if they want to get you – unless you ARE an operative -THEN you get clemency because of the IDEA that you could help them open a ‘REALLY BIG’ case to justify more budget. Privacy in the terms mentioned by @ramona kiske really means – stay OFF the Internet. Kudos to @Thomas Stromberg @wow and @Mitch for helpful comments.